To make the tartar, dice the venison neatly into tiny cubes and remove all sinew. Mix in the other ingredients then shape the mixture into four cylinders. To create the wontons, slow cook the venison shoulder with onion, carrot, red wine, beef stock, a bay leaf and rosemary for two hours. Shred the venison and cook the sauce down. Add one tablespoon of hoisin sauce. Egg wash the wanton wrappers and wrap the venison before deep frying the wontons. For the yuzu vinaigrette, mix the yuzu, mustard and honey and then pour on the rapeseed oil slowly whisking. Season and place in squeezy bottles. 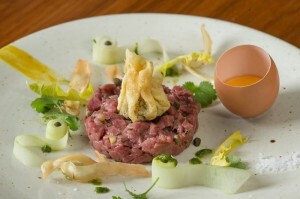 To serve each portion, place the tartar in the centre of the plate with the wonton on top. Separate the egg and place the egg yolk in the egg shell at the side of the tartar. Place crispy burdock root and dandelion yellow leaves with pea shoots and radish tops onto the plate and drizzle the yuzu vinaigrette. Sprinkle with Maldon sea salt and coriander leaves.